On the recruiting trail I see a lot of over promising and under delivering when it comes to a firm’s capabilities. 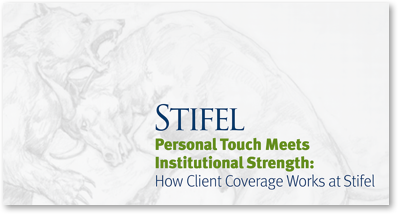 At Stifel, we take a different approach – we want to insure we are a quality cultural fit for you and your clients, then we insure we have the capabilities to meet your needs. We don’t lead with the optics of the big, typically unattainable, check. Our Client Coverage group is an example of creating bridges with your entrepreneurs, C-Suite, board members, and institutional clients. Michael Sullivan had nearly twenty years at Merrill Lynch before joining Stifel several years ago. The Client Coverage Group helps you in areas that most firms over-promise, and under-deliver – not at Stifel. Enjoy the article! 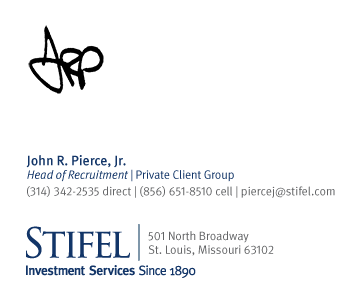 Please visit ChooseStifel.com and give me a call to discuss our Firm!